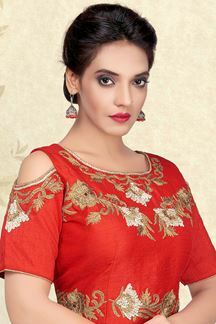 Get in vogue wearing this regal red designer cold shouldered blouse featuring rich resham & zari embroidery all over in a tasteful finish. Wear a lovely gold saree and long earrings for a complete wedding look! Note: Color may slightly vary due to digital photography.